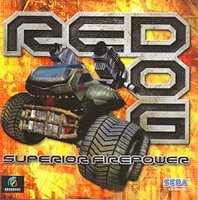 Yep, Red Dog is here - and to be honest, it aint a bad little game. Apart from the abysmal Battle Tanx on the N64 and its little known sequel, there arent that many tank based shooters out there in Games Land. Red Dog was universally lambasted upon it's release, but from playing it for a few hours its hard to see why. The graphics are pretty decent and the Red Dog unit itself handles pretty well, apart from the ridiculous strafing controls where you have to hold down both triggers and press up or down on the analogue. There is also a pretty nifty Panzer Dragoon style lock on system where you can fire multiple missiles at targets. As close to Panzer Dragoon as you can get on the Dreamcast. Its a damn fine shoot 'em up by anyone's standard and only cost £2.50 from Gamestation.